Smiling girl holding gift box. Pretty woman with gift box in hands smiling and looking at camera. Holiday greeting concept. Happy boy with a lot of gift boxes. Cute child holding many Birthday present boxes. Holiday greeting concept. Woman posing with gift box. Pretty girl with present box looking at camera. Holiday greeting concept. Cute teenage boy holding large gift box. Smiling guy offering present box on abstract blurred background. Special holiday offer. Teenage boy holding gift box. 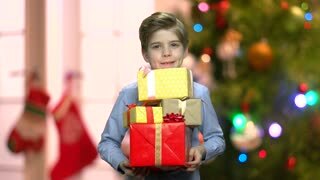 Cute boy in blue t-shirt offering present box on blurred bckground. Special holiday offer.